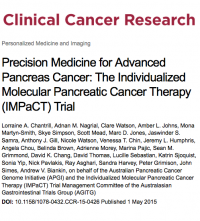 The Individualised Molecular Pancreatic Cancer Therapy (IMPaCT) was Australia’s first clinical trial looking at personalizing the treatment of patients with metastatic pancreatic cancer. The trial closed in December 2015, and many important lessons were learned about what it will take to deliver personalized medicine in the future. IMPaCT was a phase II clinical trial, assessing personalised treatment based on specific tumour characteristics in patients with recurrent or metastatic pancreatic cancer. Less than 5% of patients with metastatic pancreatic cancer survive more than 5 years and sadly there have been no major improvements in outcomes over the last 20 years. Previous clinical trials in unselected patient populations have shown only modest improvements in survival when using the current standard chemotherapy, Gemcitabine. By selecting patients based on their unique genetic make-up and matching this information to targeted therapies, we hope that the response to these targeted therapies will be much higher, and subsequently improve overall survival. The idea for IMPaCT arose to exploit results from genome sequencing of pancreatic cancer under the auspices of the Australian Pancreatic Cancer Genome Initiative, as sequencing revealed that small subsets of patients with changes in their tumour genome could benefit from existing therapies. The IMPaCT trial was a multidisciplinary collaboration between AGITG, NHMRC Clinical Trials Centre, Sydney Catalyst and the APGI. The IMPaCT trial planned initially to enroll 20 patients to determine the effectiveness of a personalised treatment approach against disease progression. The pilot stage of the IMPaCT trial assessed the feasibility of acquiring suitable tumour specimens for molecular analysis and returning high quality actionable genomic data within a clinically acceptable timeframe. What were the main findings of IMPaCT? We encountered many hurdles; particularly the swift attack of pancreatic cancer, combined with restrictive rules for managing clinical trials and delays caused by hospital bureaucracy which meant we were unable to enroll no patients formally on the trial. The American Association for Cancer Research (AACR) highlighted the experience of IMPaCT, which was presented at its annual meeting in Philadelphia last year. It also attracted widespread media attention globally through the AACR and Australian media channels, but importantly was published in the prestigious AACR journal Clinical Cancer Research. Others can benefit from these experiences in the design and conduct of their own molecular based clinical trials. 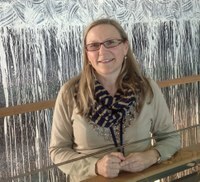 The principal trial investigator, APGI’s resident medical oncologist Dr Lorraine Chantrill said hospitals and drug regulators are going to have to change the way they look at personalised medicine, from speeding up the process for genetic testing and getting consent from patients, to giving hospital ethics committees more resources. And that drug regulators will also need to be more flexible with the type of medical research they accept. The IMPaCT trial has been a very important journey for cancer doctors and researchers. We have not only learnt ways to bring about a new paradigm of personalised cancer care for pancreatic cancer and other aggressive cancer types, but we also now have a unique resource in a cohort of patients with advanced pancreas cancer with tissue samples and genetic profiles. These will be of benefit to the research community well into the future. Trials similar to IMPaCT are currently a global challenge. Major institutions across the US and Europe are struggling to make headway in this area, as discussed at the recent Pancreas 2016 International Meeting in Glasgow Scotland. As a follow on from the IMPaCT Trial the investigators are conducting a follow-up study where all patients will be reviewed and a report written to detail the outcomes of patients in order to learn more about what happens to patients after or outside the trial, to learn more about the patterns of treatment and care in metastatic disease. This trial would never have been possible without the support and generosity of our patients and their families who continue to participate in our research despite the odds.